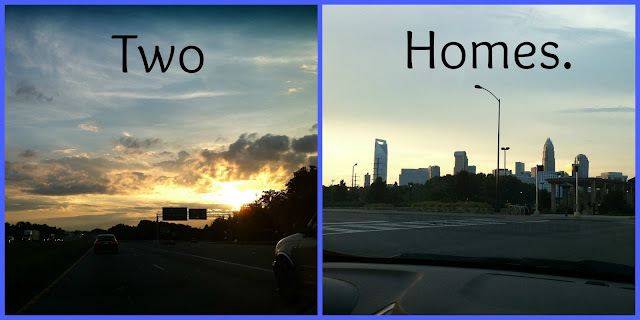 Ordinary Goodness: What going home is like these days. What going home is like these days. We headed home - like, childhood home - for the second straight weekend, the calendar just fell that way. It always amazes me how I can hop in a big metal box (at first I wrote "hope in," but I guess that's true too), somehow control it at high speeds for 4 hours, and suddenly end up where everything began. Weird and cool and gratifying and exhausting. Apparition for Muggles, please? Somebody needs to get on that. Every moment was full - birthday celebrations (two), meals out (six), driving here and there to make sure we saw everybody and did everything and got as close to that elusive "quality time" thing as possible. It starts to feel normal, like you still live here, the smells, the sounds, you already know what step is going to squeak on your way up to bed. I always reclaim my (turquoise) cup from the kitchen cabinet, one of a multi-colored set my parents (different shades of purple) bought in high school to try and keep my brother (dark blue, if I wanted him mad at me I'd call it Duke blue) and me from dirtying glass after glass. And there's always that one thing you don't get to, the person you miss, or your favorite restaurant, no time to add it in because a weekend is short, especially if you factor in a couple hundred miles to get back in time for work Monday morning. It's those missings, those things that once did seem so normal, that remind you that this isn't your day-to-day anymore. And that's heart-wrenching and wonderful, full of so many contradictions that my mind can't name them all. Being homesick for one home when you're in another home. No matter where I go these days, it always seems to be true. When we got back to our day-to-day city, we did normal Sunday night things: grabbed pizza dough from Trader Joe's, started the washing machine. Wished out loud for a fresh weekend right on top of this one - an alternate universe, maybe - where we could sleep late instead of drive, pick clothes from a closet instead of living out of a duffel. It's a good life here, and we enjoy living it. And yet - family is always 250 miles down the road. If you know me, you know that my favorite part of my childhood home is my church. On Sunday, my family and I sat with three rows of folks that I consider honorary parents, sisters, brothers. I have known them my whole life. I can't explain how at home I feel with them in the balcony, and sometimes I wonder if the ladder behind us up to the tall steeple doesn't lead straight to heaven. Simply put, they are my people. At the end of the service, the choir sang a benediction: I want to walk as a child of the light. (No. 206, United Methodist Hymnal. It's a good'un.) As I looked and listened, I couldn't help but sing along under my breath. And then I noticed: in front of me, Katie's lips formed the words. And behind me, Amy sang too. We've sung together many times; here was one more. Katie will carry those words with her back to Manhattan. Amy will bring them home just a few miles from the church balcony. And I will hold them here, in my day-to-day life, in my heart, thankful for two homes that love me, that keep molding me, even as I drive back and forth. This morning I was listening to NPR on the way to work. In the background of the story was a congregation singing "Blest Be the Tie That Binds." I've been singing it all day. So glad we are bound together, you and I, and all the rest. =) Love to you, sweet girl.